Hells, bells, iPad might be Apple's backdoor to the enterprise, after all -- and, whoa, that can't be good for Windows PCs. Gartner projects that global spending on media tablets will be as much $29.4 billion this year, up from $9.6 billion in 2010. 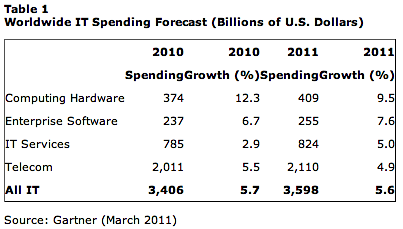 Here's the kicker: IT spending on tablets will be a noticeable chunk of that spending, Gartner predicts. Today, Gartner reiterated what it forecast in January: IT organizations will spend $3.6 trillion this year. However, the analyst firm notched down growth projections to 5.1 percent from 5.6 percent. Spending would have declined, too, had Gartner not added media tablets like iPad to the mix. The addition boosts hardware spending growth to 9.5 percent from 7.5 percent year over year. "The addition of media tablets, reinforced by an expected additional decline in the value of the dollar, accounts for the increase in top-line growth," Richard Gordon, Gartner research vice president, said in a statement. "Absent the addition of media tablets, the forecast would have slightly declined in constant-dollar terms; however, with their addition, there's virtually no change in underlying forecast growth at the level of overall IT." Gartner expects big media tablet spending growth -- 52 percent compounded annual average -- through 2015. Apple's iPad already is cannibalizing consumer PC sales. Spending on media tablets means IT organizations almost certainly would spend less somewhere else. Right now, Apple and Samsung are the only tablet manufacturers shipping in volume, but the market really belongs to Apple -- hence that backdoor into the enterprise. Apple ended 2010 with 83 percent global media tablet market share, based on shipments, according to IDC. The analyst firm predicts that iPad will command at least 70 percent share throughout 2011. So increased tablet spending and enterprise adoption will be more likely to benefit Apple than competitors, at least in the short term. That said, there's a dark horse in the media tablet race. Next month, Research in Motion will begin shipping its PlayBook tablet in volume. For all BlackBerry's recent market share declines, it is still a prized possession among many professionals, including the President of the United States. Can RIM leverage its enterprise smartphone success to PlayBook, or have too many businesses converted to iPhone or Android smartphones? During last week's CTIA Wireless, a panel of connected-device manufacturers debated whether tablets could replace laptops in enterprises. No surprise, Apple offers an iPad guide for enterprises. Enterprise tablet adoption stands to disrupt longstanding business attitudes about what applications are important and feed into IT organizations' cozying up to cloud computing. There's no Microsoft Office on iPad, and Google Docs functionality is limited, at best. Microsoft locked businesses into its software by duopoly -- Office and WIndows. Linux couldn't succeed on the desktop because the applications stack was incomplete. There was no Office. Can tablets succeed in the enterprise without Office? Fourteen months ago, I asserted that "Microsoft Office is obsolete, or so soon will." Many Betanews readers didn't like that one. But enterprise adoption of iPad and others tablets is sure to bring the Office debate to the forefront. Apple offers some productivity apps for iPad -- Keynote, Numbers and Pages -- and there are some third-party productivity apps. For many IT organizations, the cloud-connected apps could be the justification for deploying more tablets. How much does my organization really need Office and where? Can some knowledge workers use tablets instead of laptops? Can we cheaply and easily manage tablets? What apps do we really need and where? The enterprise is Microsoft's core market. Whether businesses replace PCs with tablets or push away from Office, it's all bad news -- and Microsoft has got nothing competitive to offer customers. Worse, major partner HP is turncoat, soon offering tablets -- and gasp PCs -- running WebOS. Or is Microsoft's situation really that bad? Gartner counts convertibles, slates and tablets running Windows 7 as PCs not media tablets. So there is no direct comparison or analyst calculation to gauge tablet PC sales against media tablets. Is your IT organization planning to deploy tablets this year? If so, media tablets running Android or iOS or tablet PCs running Windows? Please answer the questions and share reasons why or why not in comments -- or you can email joewilcox at gmail dot com.